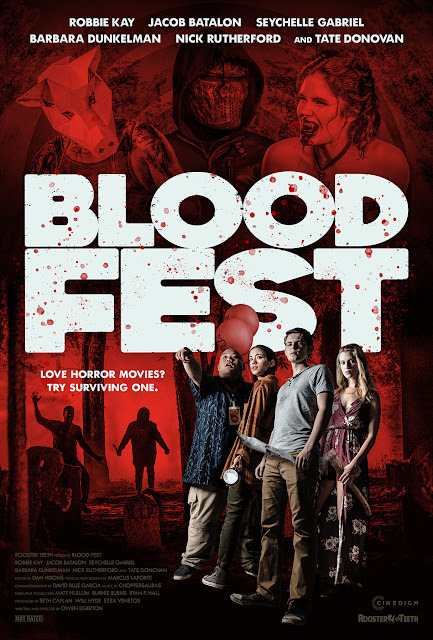 Chrichton's World: Review Blood Fest (2018): It means well, but it's far from the classic it could have been! 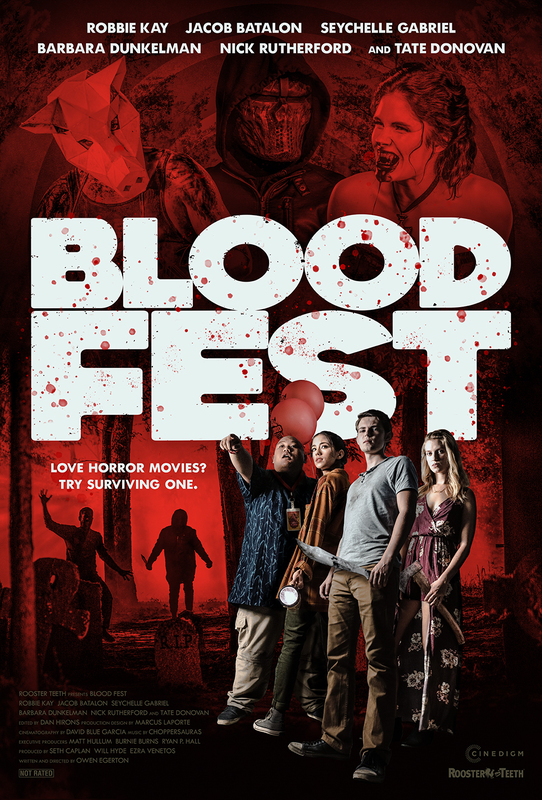 Review Blood Fest (2018): It means well, but it's far from the classic it could have been! Blood Fest has a very interesting premise. Unfortunately it never quite delivers on the goodies that are promised. Blood Fest should be seen as a film in the same vein as Scream and Cabin in the Woods where the horror genre is examined and made fun off. However apart from a few dialogues about typical horror cliches the story hardly goes anywhere. Instead it banks on the surprise factor and illogical events that are supposed to impress us. It would have, had they actually given a better explanation of how some events were made possible. They skip those quite quickly and expect you to accept whatever they tell you. I mean like more deaths and splatter. For a film called Blood Fest the splatter was very minimal. It doesn't even compare to the amount of gore and violence that occurs in a single episode of Ash vs Evil Dead. And honestly I was very willing to if they actually had given me something else to be distracted by. The horror elements for example are only effective in some scenes. And whenever you got the feeling chaos and mayhem would increase they would tone it back to a point that it slowed down the film considerably. Big contrast with the explosive and flashy start. It moved very quickly and then at one point it was starting to drags. Not that it's bothersome but mostly that I was waiting for things to happen. The few events that occur are hardly memorable or impressive which was a little disappointing There are a few surprises although some of them were revealed in the trailer so I do suggest to not watch it. Blood Fest does have a few twists and turns you won't see coming. However they lack logic and credibility. It's no use getting worked up about it since even if they are quite preposterous, they are effective. I do have one issue with one of the plot elements in which it's stated what influence horror films have on people. I am pretty sure it's meant to be a joke of some kind. Yet I do feel compelled to state that horror films don't have negative effects on people. There is no real evidence to support this unless you are one of those who have a political or religious agenda. A normal, stable person with some common sense won't be that easily affected and certainly not negatively. If a (horror) film compels you to do something chances are you would be triggered by many other things as well since you basically are psychologically disturbed already. Blood Fest has it's heart in the right place. I appreciate what it was trying to do. However it was a little too lacking to make a significant impact. I will keep an eye on writer / director Owen Egerton though since he shows promise. I enjoyed Blood Fest but it doesn't deliver on what's promised. So keep that in mind to avoid disappointment.